FDA releases its “Strategy for the Safety of Imported Food,” which outlines the agency’s comprehensive approach to helping ensure the safety of food imported into the U.S. Determining the best way to use the full range of available tools across the different segments of the international food-supply chain—in ways that decrease public health risks while maintaining a level playing field for domestic and foreign producers—requires both dexterity and pragmatism. The strategy document describes how FDA is integrating the new import oversight tools with existing tools. The strategy is guided by four goals: 1) Food Offered for Import Meets U.S. Food Safety Requirements; 2) FDA Border Surveillance Prevents Entry of Unsafe Foods; 3) Rapid and Effective Response to Unsafe Imported Food; and 4) Effective and Efficient Food Import Program. The document outlines several methods the agency is using to accomplish these goals, including strategies for objectives. Click here to access the strategy document. The USDA FSIS and the U.S. Department of Health and Human Services’ FDA announce a formal agreement to jointly oversee the production of human food products derived from the cells of livestock and poultry. The formal agreement addresses the regulatory oversight of human food produced using this new technology. The agencies agree upon a joint regulatory framework wherein FDA oversees cell collection, cell banks, and cell growth and differentiation. A transition from FDA to FSIS oversight will occur during the cell harvest stage. FSIS will oversee the production and labeling of human food products derived from the cells of livestock and poultry. This shared regulatory approach will ensure that cell-cultured products are produced safely and are accurately labeled. In a year when total grocery store dollar growth reached only 2%, organic fresh produce surpassed the status quo according to new information released by the Organic Produce Network and Nielsen. In total, organic produce sales reached $5.6 billion in 2018, with the year ending on a high note as sales increased 13% the final week of the year. Fresh produce represented 26% of total store organic sales and a growth rate of 8.6% was on par with total store organic, which suggests a continued movement toward mainstream demand across product consumption. But products like strawberries and tomatoes experienced far greater growth in the conventional offering. Pricing is important for these categories. Prices were $1.97 to $3.38 per pound between conventional and organic tomatoes and $2.26 to $4.26 for conventional and organic strawberries. Onions, bell peppers, watermelon, and mandarins are all still disproportionately under-represented in organic sales compared to the total produce average. Ensuring organic items are available for purchase, particularly at key times of the year, such as summer holidays, Thanksgiving, and Christmas, is a good starting point for commodities still trying to reach more organic shoppers. The SQF Food Safety Code for Primary Production is recognized as a procurement standard for the 2020 Tokyo Olympic and Paralympic Games. The recognition includes the production of livestock; growing and production of fresh fruit, vegetables, and nuts; and extensive broad-acre agricultural operations including rice production. SQFI has developed an addendum to supplement the SQF Primary Production Code that sets the stringent sustainability, environmental, and welfare requirements prescribed by the Tokyo Organizing Committee. 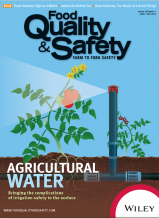 Growers and producers will be required to achieve and maintain certification to the SQF Food Safety Code for Primary Production and the SQF Tokyo Sustainability addendum. “SQFI is honored to be recognized by the Tokyo Organizing Committee and to be given the opportunity to integrate our globally recognized, GFSI-benchmarked food safety management standard with Tokyo’s rigorous sustainability requirements,” says Robert Garfield, chief food safety assessment officer and SVP, Safe Quality Food Institute. Get more information on the Tokyo 2020 Sustainability Plan here.